Figure 2. Eagleville Bridge, Washington County, NY. Reference to a covered bridge often sparks an image of a quaint setting with a narrow, but inviting, timber tunnel crossing of a stream. For some, the image is of a more substantial structure crossing a raging river, withstanding the rigors of time and nature. At one time, the United States reportedly had 14,000 of these unique bridges dotting the countryside over a surprisingly large area. Now, fewer than 900 of the historic structures survive, and pressures grow to help preserve them from replacement, abandonment, vandalism, and arson. Federal funding over the past decade has grown to augment that of the States, owners, and others to find comprehensive and proven means of maintaining the ability of these vestiges of our bridge-building heritage to continue to serve current and future generations. This manual is intended to provide comprehensive support to those involved with maintaining, assessing, strengthening, or rehabilitating covered bridges, especially heavy timber truss bridges. Although there are covered bridges throughout the world, this manual focuses on covered bridges within the United States. There is brief reference to those in other countries, primarily to provide a historical context of the development of timber truss bridges. According to the World Guide to Covered Bridges (World Guide), of the approximately 1600 covered bridges in the world, roughly 880 are in the United States. Even though there are many similarities among these bridges, no two were absolutely alike the day they were opened to traffic, and none have undergone identical use and maintenance to date. Therefore, even by limiting coverage to North American bridges, a fairly large and varied population is addressed. This manual focuses on those covered bridges supported (or at least supported at one time) by longitudinal trusses built of relatively large (heavy) timber components. This manual deals only with covered bridges, and not with those bridges that are covered. The former describes a structure that earns its keep—one that is as it appears to be—an authentic covered bridge. The other, so-called covered bridges (usually girder-supported bridges with some sort of shed on top) just happen to support a roof and walls, and are not generally considered legitimate covered bridge structures. 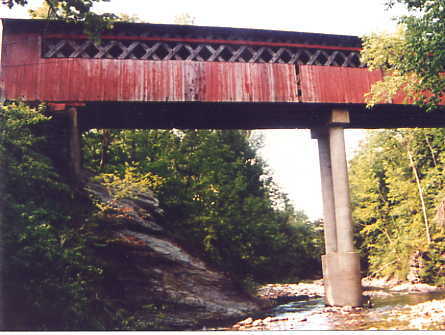 Figure 3 shows a classic historic covered bridge—the Taftsville Bridge in Woodstock, VT. This two-span bridge, supported by unique trusses with heavy arches, was built in 1836, making it one of the older covered bridges in the United States. Some authentic covered bridges have been retrofitted to remove their timber floor system and replace it with an independent system. The remaining timber-framed covering must still support its own weight, along with wind forces, and potentially snow. This manual does not separate these retrofitted structures from other authentic complete bridges; —the discussion can deal with either, and will be useful in establishing ways to evaluate the timber trusses and means of maintaining and/or rehabilitating them. Information is culled from both readily and not-so-readily available references. Because little has been written about the technical aspects of covered bridges, information is provided based on both the experience and expertise of the authors. It is worth noting that some of the information in this manual represents opinions regarding best practices, even though these practices may not be commonly or widely accepted. 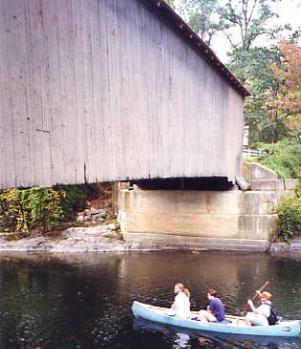 The content of this manual is strongly influenced by the Principal Investigator’s involvement in the comprehensive statewide study of 75 covered bridges in Vermont. The work, was performed by a consulting firm under contract to the Vermont Agency of Transportation, and was concluded in 1995. The study involved preparing a long-term preservation plan for each bridge based on the condition of the bridge and the traffic needs at the site. The team responsible for this manual has had firsthand hand engineering involvement on more than 110 bridges in many States. 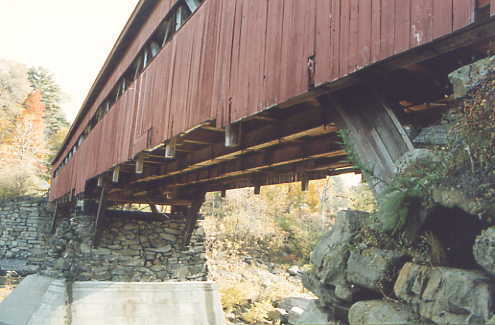 The population of covered bridges in the United States is diverse, in large part due to the nature of their construction. Few builders traveled long distances and features favored by one builder were different from those in another area. Hence, this manual presents a comprehensive discussion of the multiple facets of covered bridges, but cannot include all aspects. For bridge specifications—Standard Specifications for Highway Bridges, as adopted by the American Association of State Highway and Transportation Officials (AASHTO). These specifications were published first in 1931 and have been modified and expanded regularly. The latest edition of these specifications is the 17th edition of 2002. Chapter 9 of this Covered Bridge Manual clarifies some of the confusion regarding the differences between the AASHTO “Standard Specifications” versus the “Load and Resistance Factor Specifications” as they relate to covered bridge practice. For timber specifications—National Design Specifications for Wood Construction (NDS®) and its Supplement: Design Values for Wood Construction, published by the American Forest and Paper Association. These specifications were published first in 1944 and have been modified and reissued regularly ever since. The most recent edition was published in 2001. The NDS, is commonly cited and is the basis of timber-related provisions published by other organizations (including the AASHTO bridge specifications), is commonly cited. For an excellent overall reference regarding timber bridges is—Timber Bridges Design, Construction, Inspection, and Maintenance, published by the U.S. Department of Agriculture, U.S. Forest Service. The latest reprinting is 1990. For a comprehensive listing of covered bridges, with a synopsis of relevant information concerning them, see the World Guide, published by the National Society for the Preservation of Covered Bridges, Inc. First published in 1956, the latest edition is 1989. A new edition wais under development as of 2004. The manual is primarily intended for engineers and historic bridge preservationists to provide technical and historical information on preservation of covered bridges. However, it will also be of interest to others involved with covered bridges, including the lay persons, owners who may have some knowledge on the topic, or contractors involved with covered bridges. Accordingly, the presentation style is somewhat modified, depending on the topic and perceived audience. The manual is separated into several sections with a number of chapters devoted to the specifics of each. The first three chapters provide background information. The typical covered bridge is described, along with its setting and terminology. Some general facts and statistics are provided. A brief historical development is included to help explain how timber bridges evolved and spread across the United States. The description of bridge components section provides descriptions of the various truss configurations, discussions of the floor systems of the bridges, the various ancillary features that supplement the primary features of trusses and floor, and a discussion of the foundations that support the bridge. Technical engineering issues begins with a short chapter that explains some of the unusual challenges of work with covered bridges and why their engineering is different from that for other bridges. Other chapters are devoted to guiding specifications; clarifications of topics related to wood; loads and the increased importance of the weight of the structure and the special handling of snow in combination with vehicular traffic; nuances related to forces, stress analysis and design; and a lengthy discussion of connections. The existing bridges section is the heart of this manual. The first chapter of this section is devoted to evaluating a bridge. The next chapter provides a discussion of repair and strengthening of bridges, along with examples of three recent projects. The following chapters include a guide for preservation actions and a summary of historic considerations related to this type of work. A comprehensive state-of-the-art guide for preservative treatment of wood in covered bridges is presented as the last technical chapter. The final chapter provides a list of references and other sources of information. The appendices include case studies that provide more indepth examples of repair and strengthening of extant bridges. Examples of recent authentic-type construction at new sites and replica bridges intended to generally duplicate a destroyed bridge, are also included as appendices in this manual. The growing number of new covered bridges warrants inclusion in this manual, because many of the same issues are relevant to them as for historic bridges are also relevant to new bridges.